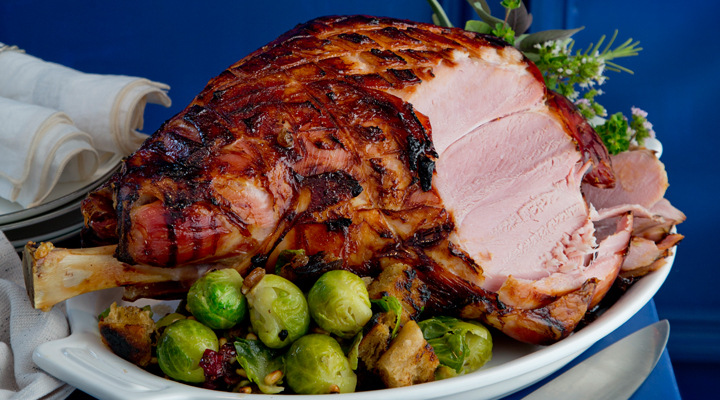 Keep the Christmas Ham simple, without compromising on taste. Put the ham in a large heavy-based saucepan. Add the studded onion, carrot and bay leaf, then pour in enough water to cover the ham completely. Bring to the boil, then reduce the heat and simmer for 5½ to 6 hours. You should allow 20 to 25 minutes per 500g for the ham. Remove from the heat and allow the ham to cool in the cooking liquor. Combine the teriyaki sauce with the honey, sake, ginger and chilli flakes in a small bowl. Put the ham on a roasting tray. Using a sharp knife, carefully remove the skin from the ham, then score the fat in a criss-cross diamond pattern. Spread the glaze over the ham with a spoon. Put the ham back in the oven for 15 to 20 minutes, until golden brown, then remove from the oven. Allow to rest for 20 minutes, loosely covered in a foil tent, before carving. Serve warm or cold.